In 1872, Victoria Woodhull, the well-known advocate of "Free Love" and women's rights, became the first woman to be nominated for president. She ran on the Equal Rights party ticket at a time when she and other women were not legally allowed to vote. She and her sister, Tennesse Claflin, published their own newspaper, The Woodhull & Claflin Weekly. 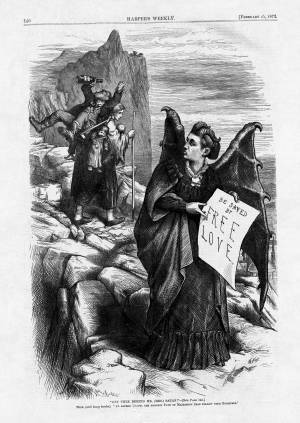 In this cartoon, Thomas Nast depicts Woodhull as Satan incarnate for her advocacy of Free Love-i.e., the rejection of marriage as an oppressive institution and the embrace of sexual freedom. The poor wife in the background spurns the temptation, despite carrying the heavy burden of children and an alcoholic husband up the steep and treacherous path of life. Near the end of the 1872 presidential campaign, Woodhull would publish allegations that the nation's most well-known and respected clergyman, Henry Ward Beecher, had been having an affair with the wife of her biographer, Theodore Tilton. In Woodhull's estimation, Beecher was hypocritically preaching one tenet while living by another, even though his adultery was a far cry from Free Love. A subsequent trial over the case became a sensational news story.